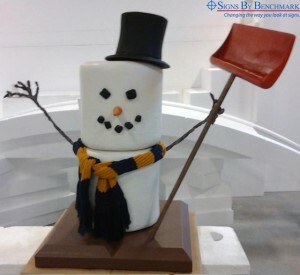 Permafrost Benny, a 3-dimensional “life-sized” marshmallow snowman, was created by Signs By Benchmark from its lightweight cellular plastic medium and signature sealing polyurea hard coat that ensures long life and durability. Widely embracing the whole idea of snowy weather, 3′ tall Permafrost Benny stands ready on a 3′ x 3′ replica cracker topped by a slightly smaller square of faux chocolate. Hand-sculpted cellular plastic facial features bring this snowman to cheerful “life” as his hand (created from metal rod and sculpting epoxy) grasps a replica shovel. Completing his outfit are a cellular foam hat and a knitted multi-color scarf. Signs By Benchmark creates promo products like Permafrost Benny, allowing sign shops to provide their customers with a more complete package. Signage accompanied by promo pieces help customers present their unique images in an imaginative way. Think “more than just signage” when you’re working up your next project. Give the team at Signs By Benchmark a call at 800-658-3444 to tell them what your customer needs to fully personify a new or established image. Then enjoy a successful collaboration that will help enhance your own business.